Diablos Tejanos: The Texas Rangers and the Road to Mexico City. "A Glimpse of Texas Past"
In March 1847, American President James K. Polk, angered by the unauthorized armistice agreed to between General Zachary Taylor and Mexican General Pedro Ampudia at the conclusion of the Battle of Monterrey, ordered General Winfield Scott to launch an invasion of Mexico by way of the port of Veracruz. 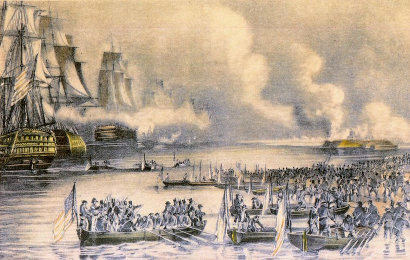 General Scott’s subsequent amphibious landing and thrust into the interior of Mexico were designed to bring a quick end to the war by capturing Mexico City. Although not present for the initial invasion, Jack Hays and his regiment of Texas Rangers were destined to play an integral part in bringing the war to a successful conclusion. painted by N. Currier in the 1840s. In an effort to accomplish his difficult mission in a timely manner, General Scott boldly abandoned the American army’s slow moving logistical tail and deliberately set out for the capital at a forced march pace that left his lines of communication and supply stretched and vulnerable. However, after meeting the forces of Mexican General Santa Anna in a series of successful, if bloody, engagements, beginning with the Battle of Cerro Gordo and ending with decisive victories at Molina del Rey and Chapultepec, Scott proved his strategy sound by capturing Mexico City on September 14. Although firmly in possession of the capital, the American army was now in a precarious position. The Mexican population in the countryside had been aroused to a fever pitch by the bitter fighting, and to make matters worse, the long road stretching back to Veracruz ran through rugged, mountainous terrain, bottlenecked by a succession of deep gorges, high peaks, narrow passes, and dense forests. Soon local bands of guerrillas gathered and moved into hiding in the mountains and forests, from where they began to bleed the American supply line with regularity. In early April, guerrillas successfully ambushed an American supply column, capturing 10 wagons. A few days later, a column of troops marching to reinforce General Scott lost a quarter of its wagons and many of its men in a well-coordinated ambush, and another column suffered a hundred dead out of a thousand on the long march to the capital, without fighting a pitched battle. The situation was steadily growing worse, and in the main, efforts to bring the depredations to a halt bordered on the ludicrous, with each punitive expedition sent out suffering more casualties than it inflicted and accomplishing little or nothing. The only unit with any success against the guerrillas was a company of volunteers commanded by former Texas Ranger, Sam Walker, who now held a commission as a captain in the regular army. The commission was a reward from President Polk for Walker’s services to General Zachary Taylor during the battles of Palo Alto and Reseca de la Palma. From their headquarters in Perote, Walker’s volunteers roamed far and wide throughout the summer of 1847, harassing the guerrillas at every opportunity; returning with captured arms, horses, and wagons, but seldom any prisoners. 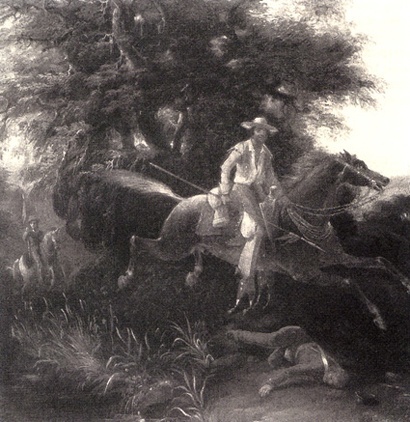 It was said that Walker’s volunteers fought the guerrillas in the only way possible, by making the countryside as dangerous for them as they made it for the Americans. General Zachary Taylor had discharged Hays’ former volunteer regiment at the conclusion of the battle of Monterrey because he did not want the responsibility of controlling their raucous behavior during the weeks of relative inactivity that followed the battle. After their discharge, Colonel Hays and his Rangers, including Sam Walker, returned to San Antonio where they received a hero’s welcome. Jack Hays and Sam Walker were not only the most popular men in Texas, but were also renowned throughout the United States for their exploits in the war. On November 7, 1846, acting Governor A.C. Horton authorized Hays to form a new regiment, and having been appointed a captain in the U.S. army, Walker was ordered to report to the adjutant general in Washington. Since Hays had business in Mississippi, the two traveled together as far as New Orleans, where their arrival was celebrated. Following his business in Washington, Sam Walker went on to New York and met with Sam Colt to discuss the Colt Paterson revolver. The Paterson had served the Rangers well, but it was far too light and flimsy to be designed for rugged use on the frontier. The weapon also had other shortcomings, including a cumbersome “pop out” trigger with no trigger guard, and the need to remove the barrel to replace the cylinder, making it impossible to reload on horseback. Colt agreed to incorporate the changes Walker suggested in exchange for Sam’s help in persuading President Polk to purchase the new weapons. 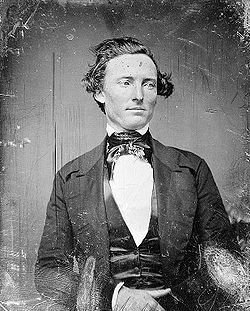 Sam’s efforts were successful, and on January 4, 1847, a contract was signed whereby the United States agreed to purchase 1000 “Walker” Colt revolvers. 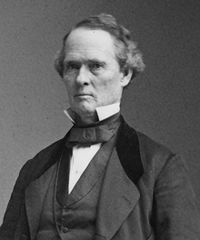 Meanwhile, a federal requirement that all enlistments must be for the duration of the war, was making it difficult to fill the roles of the new Ranger regiment, so Texas Governor James Pinkney Henderson sent Jack Hays to Washington to discuss the matter with President Polk and the secretary of war. The discussions went well, and in response to Hays’ mission, an order was signed on March 20, 1847, authorizing Ranger enlistments for one year. While in Washington, Hays also met with Sam Colt, who wanted him to see the new and improved six-shot revolver that Sam Walker had helped to design. Colonel Hays was impressed, and Colt assured him that his regiment would be issued the new weapons once Walker’s company was supplied. Upon his return to San Antonio, Colonel Hays assumed command of the First Regiment, Texas Mounted Volunteers that was in the process of forming and took time out to be married in Seguin to Susan Anderson, the daughter of a Presbyterian pastor. By early October, all five Ranger companies in the First Regiment were encamped on the Jalapa Road at Vergara, Mexico, three miles west of Veracruz, where most of Hays’ 580 Rangers were issued two Walker Colt revolvers. After two weeks of intense training in marksmanship and maintenance, the Rangers were highly proficient with the new weapons. The First Regiment of Rangers soon joined General Jo Lane’s column marching to the relief of Puebla, where Hays and his old friend, Sam Walker, were reunited. The Rangers assumed the duty of screening the advance of Lane’s brigade, with Walker and his volunteers in the vanguard, far ahead of the infantry. The volunteers were the first unit to meet Santa Anna’s forces at the small town of Huamantla. General Lane had warned the aggressive Walker to wait for the arrival of the infantry before launching his attack, but Sam yelled charge the instant contact was made and rode at the forefront of his company as they poured into town, firing their Colts and slashing at the enemy with their sabers. At first, the fury of the charge drove the Mexicans back and the volunteers were beginning to carry the day, when Santa Anna came up with his full force. In the heavy fighting that followed, the Americans were pushed back, until Lane’s infantry arrived on the scene. Bayonets flashing, the American infantry soon swept the Mexicans from town and captured their artillery, but not before Sam Walker was killed. General Lane said of Sam: “Foremost in the advance, he had routed the enemy when he was mortally wounded.” Hays and his Rangers took the place of Walker’s volunteers, and General Lane moved his brigade to Puebla, quickly breaking the siege. Filled with hate and fury over the death of his best friend, Jack Hays spent the month of November leading his Rangers in a wide swath of destruction all the way north to Matamoros, putting a severe damper on the activities of the local partisans. "Hays' Regiment of Mounted Texas Volunteers, 1847"
When Colonel Hays led his Rangers into Mexico City on December 6, 1847, the streets, windows, and rooftops of the capital were thronged with curious residents eager to get a closer look at the infamous Diablos Tejanos. General Ethan Allen Hitchcock wrote: “Hays’s Rangers have come, their appearance never to be forgotten. Not in any sort of uniform, but well mounted and doubly well armed.” Regimental Adjutant John “Rip” Ford later recalled, “When the Rangers arrived, many Americans were being killed within the city, but now men had come who took eye for eye, tooth for tooth . . .” Trouble was not long in coming. When the regiment halted and formed up in the Grand Plaza, a hungry Ranger grabbed a handful of candy from the basket of a nearby vendor. Thinking that he was being robbed, the Mexican picked up a stone and hurled it at the Ranger. The Ranger killed the vendor with a single shot from his Colt, causing the huge crowd to panic and run for their lives. Hays, who refused to tolerate thievery, quickly ascertained that the offended Ranger had intended to pay for the candy after he had sampled the vendor’s wares. Later that evening, a few Rangers were entering a theater when a pickpocket grabbed one of their handkerchiefs and ran. The thief was shot dead when he ignored an order in Spanish to stop, and the Texas Ranger coolly retrieved his property as if nothing had happened. A few days later, Ranger Adam Allsens wandered alone into one of the less reputable sections of the city known as “Cutthroat,” and was literally cut to pieces in a vicious attack. Allsens was buried with full military honors, as the Rangers in his company stood by, grieving in silence. The following morning, more than 80 bodies were found lying in the streets of Cutthroat. General Scott called Hays into his office to protest the slaughter, but Hays faced “Old Fuss and Feathers” down, quietly stating that no one could “impose” on his Texas Rangers without expecting retaliation. Not wishing to offend an influential friend of President Polk, General Scott dropped the matter, but soon found employment outside the city for the highly volatile Rangers. After the “Allsens” incident, few Americans, and not one Ranger, were killed while serving on occupation duty in Mexico City. 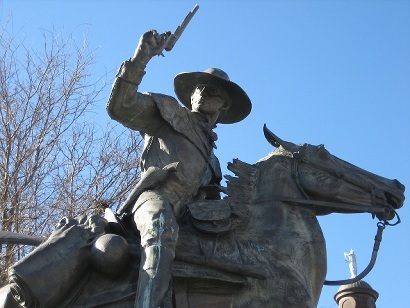 The methods employed by the Texas Rangers may well have been exceedingly harsh, but they accomplished much more than ending the isolated attacks on Americans. For Mexicans, the word Rinche, meaning Ranger, was fast becoming a word of dread. Although usually outnumbered, the Texans’ greatest asset was the fact that most of the guerrillas lived in fear of them. In fact, the Rangers’ growing reputation as fierce and relentless warriors was almost as valuable in their efforts to pacify the countryside and bring an end to the guerrilla depredations as the expert use of their Walker Colts. Jack Hays statue in front of Hays County Courthouse in San Marcos. 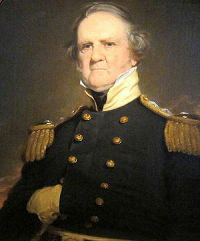 Colonel Hays also took control of the Rangers’ passions and kept them in check when the occasion called for cooler heads. During the final stages of the war, word spread throughout the regiment that Santa Anna would pass through the Texas Rangers’ Jalapa Road encampment on his way to Veracruz and exile, with a safe-conduct pass signed by General Scott. Safe-conduct pass or not, there was violent sentiment among the ranks to hang the dictator in revenge for the many atrocities he had committed against the Texans. Hays immediately put an end to the wild talk, not by threats of punishment or harsh discipline, but by simply stating that such a move on the part of the Rangers would dishonor Texas in the eyes of the world. Not surprisingly, a noticeably pale and frightened Santa Anna passed safely through the Ranger camp. 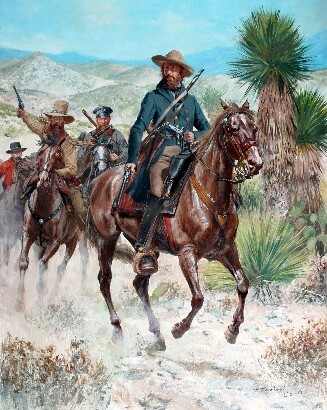 In February, 1848, the Treaty of Guadalupe-Hidalgo brought a formal end to the hostilities between Mexico and the United States, but the legendary exploits of the Texas Rangers would live on and continue to grow in correspondents’ news articles and in the admiring diaries and letters of veterans. The image of Jack Hays had become the very definition of a typical Texas Ranger; a quiet, modest, essentially decent man who neither courted trouble nor backed down when it came his way. All across the United States, Americans sensed something new in this heroic band of men, and by 1848, the terms “Texas Ranger” and “Colt Revolver” had grown to be common household words. References for "Diablos Tejanos: The Texas Rangers and the Road to Mexico City"
Bayer, K. Jack (1974), The Mexican War, 1846-1848, Bison Books, ISBN 978-0803261075. Davis, Joe Tom (1989), Legendary Texans: Vol. IV, Austin, TX, Eakin Press, ISBN 0-89015-669-7. Eisenhower, John S. D. (2000), So Far From God: The U.S. War With Mexico, 1846-1848, Norman, OK, University of Oklahoma Press, ISBN 978-0806132792. Fehrenbach, T. R. (1968), Lone Star: A History of Texas and the Texans, New York, NY, Macmillan Publishing Company, ISBN 0-02-032170-8. Foos, Paul (2002), A Short Offhand Killing Affair: Soldiers and Social Conflict During the Mexican-American War, Chapel Hill, NC, University of North Carolina Press, ISBN 978-0807854051. Winders, Richard B. (2001), Mr. Polk's Army: The American Military Experience in the Mexican War, College Station, TX, Texas A&M University Press, ISBN 979-1585441624. The United States Army Campaigns of the Mexican War, The Occupation of Mexico, May 1846-July 1848, www.history.army.mil/brochures/Occupation/Occupation.htm.